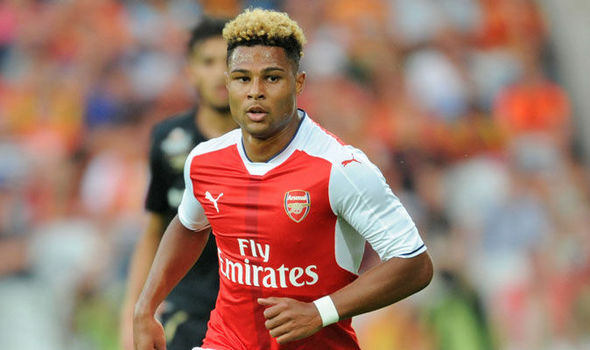 Serge Gnabry who is officially known as Serge David Gnabry is a German professional footballer is currently playing for English giant Arsenal. He was playing in last Rio Olympics with German team and made an undeniable contribution there but unfortunately they were defeated in final against the host nation Brazil by penalty shootout after the full times over by scoring 1 – 1. That was so dramatic and also pathetic for them. Now, there is a recent news spread that the 21 years old German international is about to move to his home club Werder Bremen where earlier this summer Bundesliga top tier Bayern Munich was keen to recruit him and also interested about him till now. Now, the River Islanders has stated clearly that they have already made a term with the player and both parties have agreed about it. So, if the news is valid, then they will have to act quickly where the transfer window will shut today and Bremen hopes that the move will be completed within next 24 hours. German winger moved to the Emirates stadium in 2012 which is also his first senior club but failed to play regularly where till now made almost 10 appearances only and scored once. In the meantime, he also spent a loan period with West Bromwich Albion in last season but there also he was not given to perform any match only but one. Now, he desperates to get proper chance to play and here is chance to play with his own nation’s club and they also has confirmed him to play with the first team. On the other side, Arsenal would not want him to let go at the end of the window where he has still one year contract left which will valid 2017. Now, according to the news, the Gunners want to make new deal with this German international. However, Gnabry has passed to difficult seasons with the Gunners and also faced a injury but now, he thinks that he regains his complete fitness. He was also wanted by several clubs including Schalke and they wanted to bring him on loan. The Bavarians has also interested to sign him and willing to offer him more than Bremen reportedly but Frank Baumann who is the sporting director of the River Islanders has rejected the possibility to move their target to the German top tier. He claimed that Serge Gnabry wants to play with them, not others and the Bavarians has no need for another transfer this summer.